In my April SOS review I said the MPC Live was a breakthrough device; I may even have allowed one ‘game-changer’ to slip through the marketing-speak filter. It’s not so much that the MPC platform itself has gone through a revolutionary change, in fact its core workflow has stayed largely the same. Rather the latest MPCs represent a new approach, or maybe the renaissance of an older one. Our modern project studios are a tangle of peripherals: a laptop and DAW, audio interface and mixer, MIDI and CV interfaces, MIDI input devices, control surfaces and monitoring controllers. The new MPCs, and the MPCX in particular, combine these elements into a single, portable, purpose-built production hub. The MPCX doubles as a controller for the MPC2.0 software.Like the Live, the MPCX runs stand-alone, differentiating it from the MPCs of recent years which were pure controllers for the MPC software. It has the same onboard processing and storage systems as its baby brother, but greatly expanded controls and audio and instrument connectivity. The MPCX doubles as a USB controller and audio/MIDI interface for the MPC2.0 DAW or plug-in using exactly the same user interface, with projects able to move between the two environments. 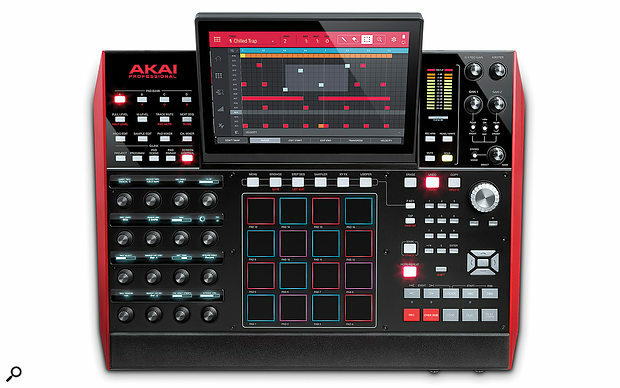 The Live model takes its design from the MPC Touch. 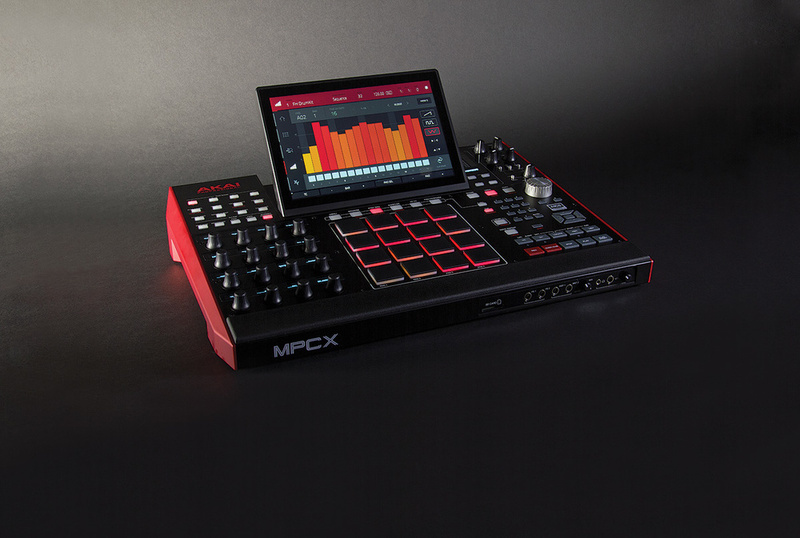 The MPCX evolves the classic form factor of previous flagship MPCs, looking like a concept-car version of the MPC Renaissance. It’s certainly an imposing workstation, almost console-like with its wrist-rest. While the Live and Touch tucked naturally between my keyboard and screen, this required a bit more thought. I tried it on the heavy-duty music stand that normally houses a Push 2 or Maschine, but this wilted under the weight. It ended up on the desk with my synths, where it turned out to be quite at home given how much less focused I was on the computer while using the MPC. This also put things within easy cable reach of the generous eight CV outputs, four MIDI outputs and two MIDI inputs. 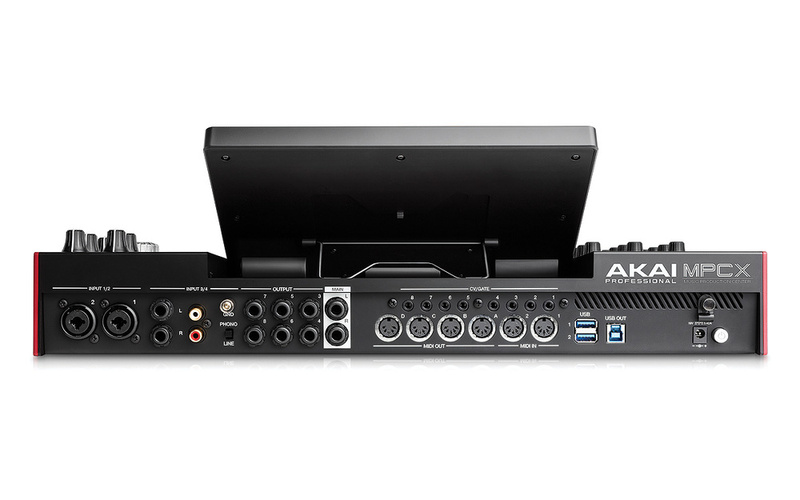 The main audio output section on the rear is only slightly expanded compared to MPC Live, with eight TRS outputs instead of six. However, there are also both quarter-inch and mini-jack headphone connections on the front panel (thank you!) with a level pot that controls the main stereo output volume too. There’s more of a difference between the models on the audio input side. The MPCX has a pair of dual-format XLR/TRS mic/line inputs on the rear panel alongside a further two TRS line inputs and phono turntable connections. The front panel then has two instrument inputs for direct connection of guitar or bass. The various connections route to four input channels. The main Mic/Line inputs share paths with the instrument inputs, with selection from the mixer section on the front panel where you’ll also find gain controls, a phantom power switch, master level control and a mix control for blending direct input signals with the MPC output. There’s an extra twist with this I/O, but first let’s look at the rest of the connectivity. The MPCX’s back panel is generously festooned with connections for audio, turntable, MIDI, CV and Gate, and USB. There are also additional audio inputs, headphone sockets and an SD Card slot round the front. One of the most compelling things about the new MPCs is how much gear you can connect to them. As well as the usual USB-B port for connecting to a computer, the MPCX has two USB-A ports for plugging USB peripherals into the unit. (This, I might add, is more than my new Macbook Pro). The USB ports can connect to class-compliant MIDI keyboards, pads, and controllers. You can also use regular computer peripherals like an alpha-numeric keyboard, which can speed up naming tasks. USB is one of many ways you can connect storage devices to the MPCX. There’s already a 16GB internal SSD system drive, but the lion’s share of this is pre-loaded with factory sound content. If you’re likely to keep large projects and your own sample library on the unit you can install a full-on grown-up SATA drive in an internal bay. A quick look on Amazon shows that £$50 will currently buy you a Terabyte of spinning disk space, or 120GB of SSD. In an MPC! For more traditional ad hoc file transfer, an SD card slot is easily accessed from the front of the workstation. In the MPC Live review we were teased by the promise of wireless capabilities being added in the future. This materialised in beta form during the MPCX review and includes both Wi-Fi and Bluetooth connectivity. The Bluetooth connection can pair with wireless MIDI controllers, but I used it to connect a QWERTY keyboard. The Wi-Fi provides Ableton Link, the simple yet brilliant tempo-locking system that’s being adopted at a fast pace by both traditional hardware and software as well as mobile apps. I didn’t have much luck with Bluetooth MIDI: Akai have tested with their LK series, but my Korg Nano wouldn’t pair. Wi-Fi connected painlessly, however, and I was able to jump on a Link session with Ableton Live and play in sync. Beat Clock and MTC can also be both chased and generated by the MPCX, giving you full song position or timecode sync, but Link is ideal for many scenarios, allowing you to cue to any position and jump in on the bar with automatic tempo lock. So, if you read the MPC Live review you’ll already know the twist I was teasing. All the MPCX’s hardware connectivity (except for Bluetooth) becomes available to your computer when you flip to controller mode. In other words it becomes a USB hub, 4x8-out audio interface, 2x4 MIDI interface, and 8-out CV interface. This makes it possible to hook up all your kit and hop between stand-alone and computer-based operation without re-cabling. Any storage devices, with the exception of the MPC’s system drive, will mount on your computer when in controller mode, making your projects and sample library accessible in either mode. Veterans of previous large-format MPCs from the 2500 through to the Renaissance will find their muscle memory needs minimal realignment. The right-hand section with the transport, keypad, cursors, data wheel and Main view buttons is much the same. The cursors now have an Enter button in the middle in addition to the traditional one on the numeric pad. However, as with the Live, I almost never used anything other than the main data wheel, which is targeted by tapping the screen. The Live’s wheel can be pushed instead of using an Enter key, an option I missed on the X. The MPCX is considerably bigger than its Live sibling, the front panel measuring 505 x 424 mm. The size of the MPCX has allowed many aspects of the user experience to be improved over the Live and Touch. Nearly all the MPC’s many modes are accessed in one press using dedicated buttons, without having to open the menu grid on the screen. The six most frequently used views/modes are directly below the screen, replacing the now obsolete Function buttons. All other modes live together to the left of the screen. If you know MPC, this should all make sense and you’ll be fluent on the surface in no time; if you’re new to MPC there’s quite a bit of work to do to learn the system, which uses dedicated views and modes for each task. When reviewing the Live I said I preferred the rubber buttons to the X’s hard plastic ones, but the latter grew on me, and the sections you interact with the most (encoders, pads, transport and wheel) all feel really good, as well as durable. The pads are a joy, easily my favourite on any comparable device, and the Q-Links (knobs) are perfectly placed and weighted for real-time tweaking. Of course the stand-out feature on the hardware is the 10-inch touchscreen. This features an adjustable viewing angle, using a metal bracket at the back to keep it rigid in the face of enthusiastic poking. The screen can lie completely flat and flush with the rest of the panel, which is ideal when you’re standing up. It’s bright, very responsive, and the extra size makes it even more accurate and comfortable to use. I was sceptical before, but it’s perfectly usable even for fine piano-roll editing. As I’ve previously reported, the team at Akai have managed to design a dedicated touch interface for the MPCs that enhances the hardware experience rather than undermining it. Because the UI was designed to be fully stand-alone, it lets you work without referencing your computer when in controller mode. What I would say though, is that it sometimes feels held back by its heritage. 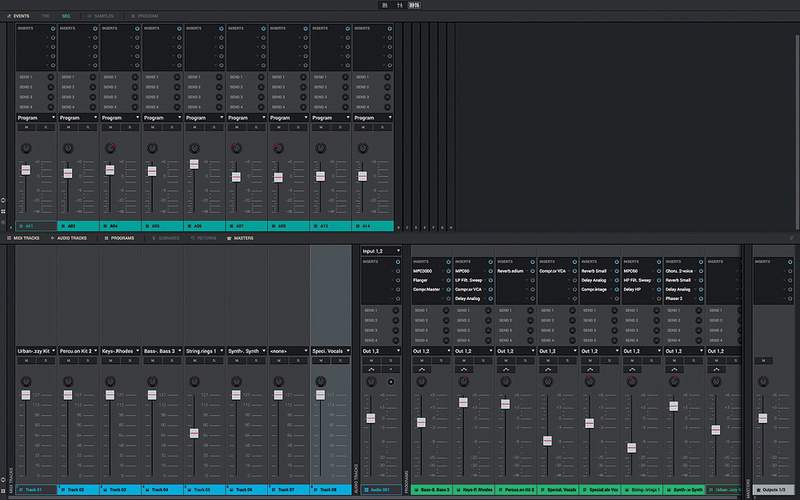 The fragmented, one-view-per-task MPC workflow made sense with the older tiny screens, but now I find myself wanting the multi-track timeline view, mixer page, and Song overview that the MPC software offers. Split screen options, or lockable views would also be great for live performance. For many long-time MPC users the core functionality is sampling, whether it be from records, instruments or vocals, and being able to manipulate and use those samples in new musical ways. As we’ve seen, the MPCX allows direct connection of any of these sources. Within a few minutes of unboxing I’d played in a bunch of sounds from the Pocket Operator I’m testing and sliced them to a new kit. Samples can be captured directly into the Sampling page, but any audio that comes into a project via importing, audio track recording, or bouncing also goes into a general pool and can be used as raw materials elsewhere. The touchscreen’s new sample edit page with tempo-matched warping. The main MPC Sample Edit mode gives you access to all these samples, and a place to edit and assign them. There’s also a Program view that lets you work on samples within the context of the kit/instrument where they are used. 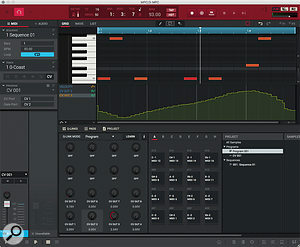 This idea has been expanded in the very latest software version by adding sample editing functionality to the Program Edit mode, much more in line with other sampler instruments. Here you have quick access to all of the four sample layers that can be assigned to an individual pad. 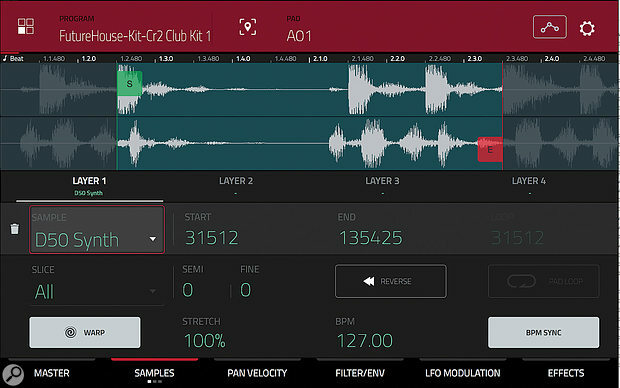 Sample editing is a showcase for the touchscreen and the Q-Link knobs. The MPCX has 16 of these touch-sensitive endless rotary encoders, compared to the four on Live/Touch. They have OLED displays showing their current assignment and value. The whole 4x4 control grid can be switched between five modes with the buttons above them. The default is Screen Control, which dynamically populates the knobs based on the current touchscreen view. When editing samples the encoders provide display zooming and editing of start, end, slice and loop positions with several resolution options. You can also accomplish any of these tasks directly from the screen. I found you can edit really quickly by setting a rough position on the screen then making fine adjustments from the Q-Links. Most other areas of the software have similar context-appropriate control sets, some better thought out than others. You can set up custom assignments within the various Q-Link views, each of which focuses on a different level of your project. There’s a page for Project controls that can include any parameter in your project so is good for making a live master control. There’s a page with controls for the current Program, or (my favourite) a whole page dedicated to the currently selected Pad. These views are variously stored within the Project or Programs only, so you’d need to make templates to reuse your assignments. So who is the MPCX for, and is it the beginning of a new approach? Or the evolution of an old one? I got started with a 4-track cassette portastudio, and I can still remember the excitement at the possibilities. With one box I could overdub sounds from my drum machine and guitar, and I could take it to rehearsals and record a band! Then I got an Atari ST and it all went downhill... The MPCX offers the chance to cut through a lot of the faff of modern music production, and give you a single point of interaction. The MPCX isn’t really trying to be a full-on multitrack recorder though, or it would probably need more simultaneous inputs and be able to stream audio from disk instead of RAM. Rather it’s an electronic music workstation whose sampling and mixing capability crosses over into audio track recording. It’s no accident then that the MPC has been so popular in hip hop and rap, but these same strengths make it a match for any singer/songwriter who embraces modern production. Electronic music producers who, like me, come to the MPC party late after years of using pattern/scene-based drum machines, Maschines and Pushes, may struggle with the very different way that MPC structures things. There are some refreshing things about MPC’s modular approach: Programs (which can be Kits, Keygroup Instruments, MIDI or CV outputs, or plug-ins) are independent of tracks, and can be played by multiple tracks; each Sequence (the closest MPC has to a Scene) can have a different track structure, or in fact be a completely different idea or song. In fact if duplicating a sequence wasn’t so laborious, and song mode was not so restrictive the whole structure could actually make a good alternative to pattern workflows. There is one use case that could be the extra secret weapon that wins over more electronic musicians. The MPCX turns out to be a great sequencing and mixing hub for a modular synth rig. A CV Program type lets you assign any two of the eight CV output to notes (1v/octave) and gates, essentially making a MIDI-to-CV converter that you can play from any track. You could sequence four synths at once like this, or more if you just need gates. You can also convert velocity and/or mod wheel data to CV outputs. The only thing you can’t do is assign Pads in kits to gate outputs, which would be nice, and there’s no clock connections. What you can do, though, is control any of the CV outputs manually from the Q-Links, with voltage displayed on the OLEDs. From here you can manually modulate CV and record automation. You can then patch audio from your synth rig back into the MPCX to record, sample, play with in the Looper and run though the X-Y performance effects. An instance of the MPC plug-in controlling a modular synth. The MPCX is an amazing bit of kit. It’s not cheap, but it has such an uncompromising spec in terms of onboard connections and storage that you really could build a live show, recording rig, or writing studio around just one device. While it’s not as portable as the MPC Live, and it doesn’t share the internal battery that I loved so much, the size makes room for the extra Q-Link encoders and dedicated displays that really enhance the touch interface and would be very useful in a live situation. The real joy (and at times distraction) of having these MPCs is that you can jump in and get something started very quickly, without wading through the usual studio/DAW pre-flight checklist. You’ve got your sounds on board, sampling and slicing is smooth, and finger drumming on the pads is so nice you might never use the touchscreen step sequencer. It’s what to do next where I get stuck with the MPC. I know there are people who use an MPC to create full songs; I’ve watched countless videos, I’ve experimented, I’ve lost sleep trying to be one of them. I know Akai don’t want to break the workflow of earlier MPC users, but if there were MIDI clips, instant Sequence duplication, and a visual timeline on the screen I think I’d jump in with both feet. However, the controller mode and plug-in mean you don’t have to fully commit to MPC — I’d still love to have one as a musical sketchpad and performance sampler to then dock with Pro Tools, Live or Reason. And even if the MPC isn’t your main composition or production tool, it could still be the best place to host electronic and sampled elements in a live show. If you’re a veteran MPC user who was unconvinced by the previous generation of hybrid controllers, you’ll love this: it’s every bit a classic MPC and more. Or if you’ve always been a bit MPC-curious, there’s never been a better time to give it a try. Elektron’s Octatrack (and Digitakt) offer sampling and beat creation with MIDI sequencing. They are focused on hands-on performance and manipulation and have the popular ‘parameter lock’ step automation. Korg’s Electribe Sampler can do a lot in a portable and affordable unit. Pioneer’s Toraiz SP16 is easy to use, has a good Pattern and Scene management structure and a song mode that you can drop in and out of. They are all good at what they do but none has the scope and connectivity of the MPCX. If possible you need to live with each of them for a few days to see what fits. As a production environment MPCX squares off against Maschine Studio and Live with Push 2. 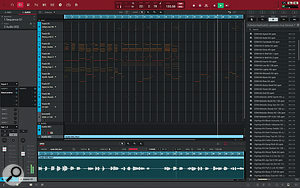 Maschine offers a really fast workflow and is improving as an all-round system with its Ideas Space, Jam and Arranger developments, but lacks audio tracks for now. Live is a true DAW with the best audio track capability, and is exceptional at capturing song arrangements. Nevertheless, the MPC has several unique differentiators in this category, not least being the touchscreen, onboard connections and stand-alone operation. The MPC Live review in SOS April 2017 covered the core new features available in the MPC2.0 and stand-alone systems. Let’s have a quick recap and see where things have moved on since then. 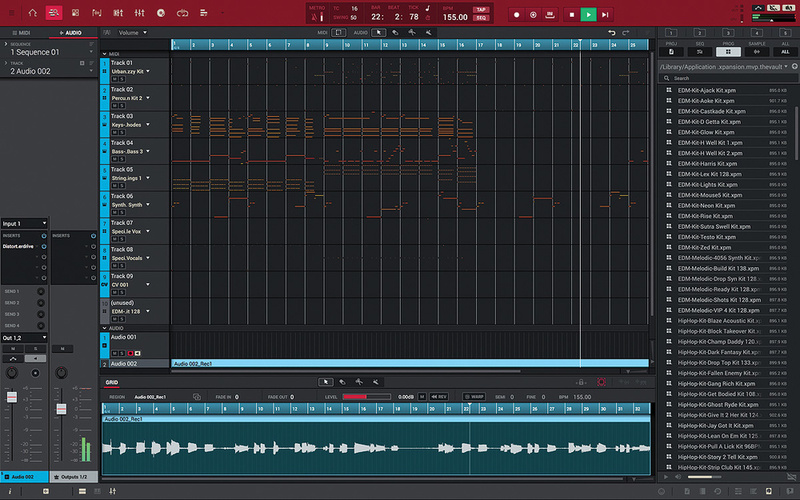 The biggest new feature was Audio Tracks, a new type of track where you can import, record and edit audio in a familiar DAW-like way. I got even more use of these with the X simply because I could plug a bass or guitar straight into the front panel. Hardware-based editing of audio tracks is handled very nicely, and is the same whether working stand-alone or controlling MPC software. The latest release has tightened up touchscreen editing even more, with indicator icons showing where in a clip to drag to move or trim. You can now edit multiple selected clips simultaneously, and can select and cut out parts of a clip. Another big change in 2.0 was the addition of warping features in the audio engine, which was especially useful in powering the new Clip Launch program type. By popular request this has now been extended to drum programs in both stand-alone and software modes. Warping can be enabled on a pad-by-pad basis. You can pitch and stretch pads manually, but more importantly now you can tempo lock them so they’ll warp automatically to match the master tempo. This is really useful for pads that contain longer samples, slices or breaks. These controls are all part of the simplified Program Edit Samples tab that also now offers in-line sample editing of all pads layers. 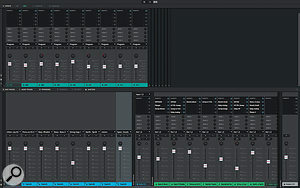 The Updated, detachable Mixer view in MPC Software with split active pads view.Version 2.0 saw the long-awaited redesign of the MPC software/plug-in and the adoption of the stylish look of the touch user interface. 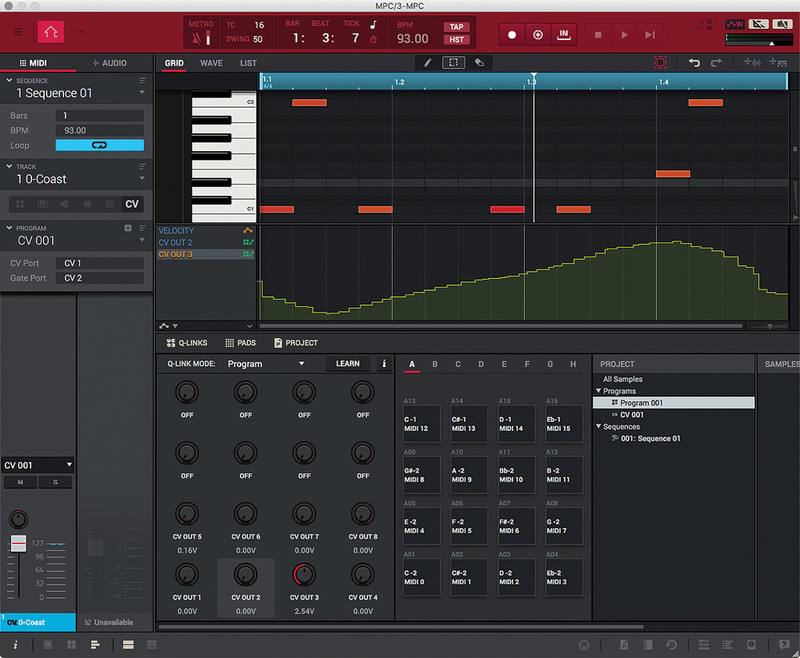 The biggest software addition was a completely new mixer, which shows what the Akai design team can do when they don’t have to worry about disrupting legacy workflows. This modular mixer can show channels for every object type in an MPC project: programs (instruments, kits), individual pads, the MIDI tracks that play them and other external gear, Audio Tracks, Submixes, and Masters. Since the Live review, an update has introduced a detachable mixer window which takes this concept to the next level, literally. A two-tier arrangement puts the mix channels for the individual pad/sample elements of the selected track on their own row. The coolest feature though is the Events view filter that only shows the channels that are actually doing something in the Sequence. Other incoming features that we previewed include the Wi-Fi Ableton Link and Bluetooth connectivity and the arrival of the Event List editing to the Touch interface. 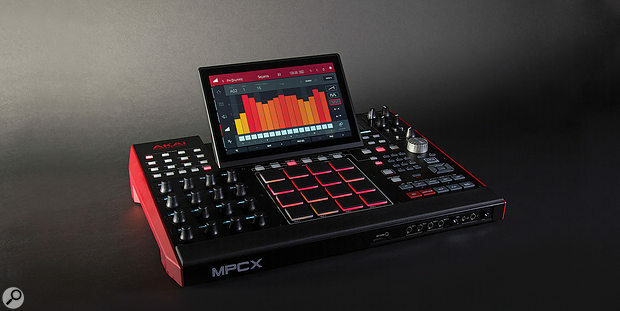 So you want to get a stand-alone MPC, but which one? While the Live and X models seem to be aimed at different scenarios it’s trickier than you’d think. The Live might seem to be the obvious choice for gigging because of its size. The portability also seems to make it ideal for recording/jam sessions or as a singer/songwriter’s sketchpad. But it doesn’t have mic or instrument inputs like the MPCX, and while the X won’t go in your bag it’s portable enough to stick in your car (especially as you can leave your laptop and interfaces at home). The X also has that lovely big screen, all those encoders with OLEDs, and quicker navigation. But for me, even if money were no object, I think I might still go for the Live purely because of the Li-Ion battery. Probably. Instrument, Mic, Turntable and CV connections. Fast and easy recording and sampling. Context-aware and customisable encoders with displays. Projects can open in your DAW via the plug-in. Many modes could be further consolidated. Song mode and arrangement could be way better. The MPCX is an uncompromising and eminently tactile music workstation that puts everything you need in one place.